Remember those M&M Sugar Cookies at the mall? The ones you’d beeeeeeeg your mom to buy you? These are those. But they’re made at home so they’re cheaper, taste better, and you can make them dairy-free. Note: these have a dairy-free option. The cookies themselves are easily made dairy-free. M&Ms are not dairy-free. However, there are candies that look like M&Ms that ARE safe for dairy allergies. See below for links. Going to the mall for dinner was a big thing when I was a kid. I don’t remember why, but I think it had something to do with my mom not wanting to cook. We’d head to the food court at the local mall and eat dinner next to the ice skating rink. In fact, it was at that very mall, during one of those dinners, that I lost my first tooth. I was eating a ginormous chocolate chip cookie from the cookie stand. I had to give the tooth fairy and IOU on that one – swallowed it right down. Fast forward through years of mall visits, and my favorite cookie was always the M&M sugar cookie. 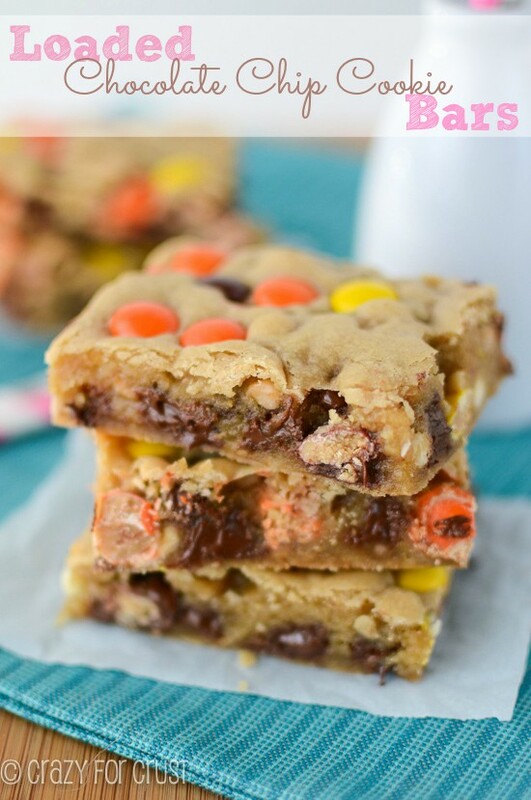 Chewy but crunchy with the best flavor, and topped with lots of colorful M&Ms, it was the perfect cookie. It was also magical. 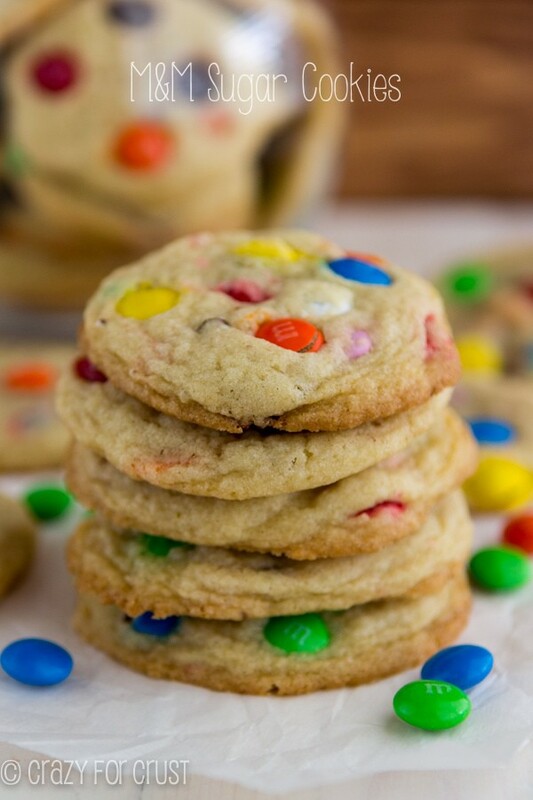 The trick is to press the M&Ms into the cookie after it’s on the cookie sheet…before baking. Then the cookie flattens and it’s topped with M&Ms. Magic. 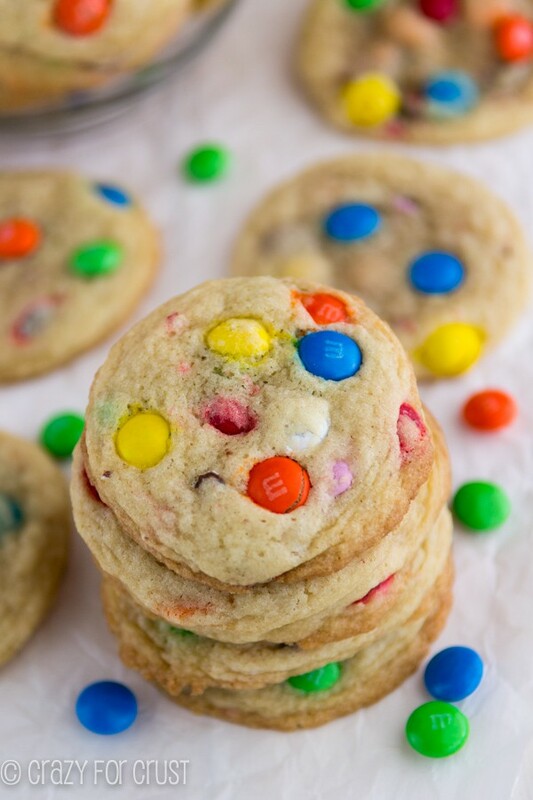 These cookies are even better: there are M&Ms on top of the cookie and inside! 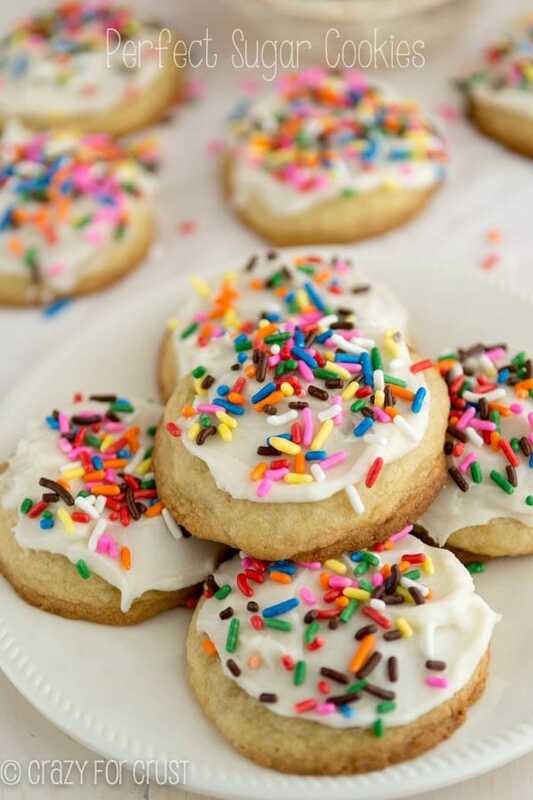 I used my perfect sugar cookie for this recipe. They’re soft and chewy and just, well…perfect. The best part about them? No chilling. I’ve baked lots of cookies since January, when I started testing recipes for my cookbook (Dessert Mashups: Tasty Two-in-One Treats, out this fall) and I learned a few things about cookies. First, sugar content. While cookies like chocolate chip and peanut butter usually have double the amount of sugar than fat, sugar cookies usually have a 1:1 or close to that ratio. Sugar causes spread in cookies. Less and they don’t spread as much (great for cutouts) more and they spread a lot (thus requiring chilling). These cookies have 3/4 cup butter to 1 cup of sugar. It’s kind of an in-between mix and results in a cookie that’s sweet and soft and chewy that spreads…but not too much. Second, leavening. Baking soda is the usual leavening I use in most of my cookies, and it also contributes to spreading. Bake the same exact cookie recipe twice, once with 1 teaspoon of baking soda and once with 1/2 teaspoon and you’ll see what I mean. Using less baking soda gives less spread, which means I don’t have to chill my dough and I can still get a soft cookie that doesn’t spread too thin. 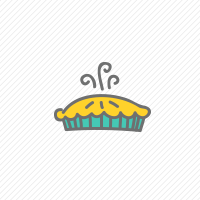 Third, the cream of tartar. Combined with baking soda, cream of tartar is used as an additional leavening source to help the cookies rise. Using it gives the cookies a more pillowy texture than just using baking soda. 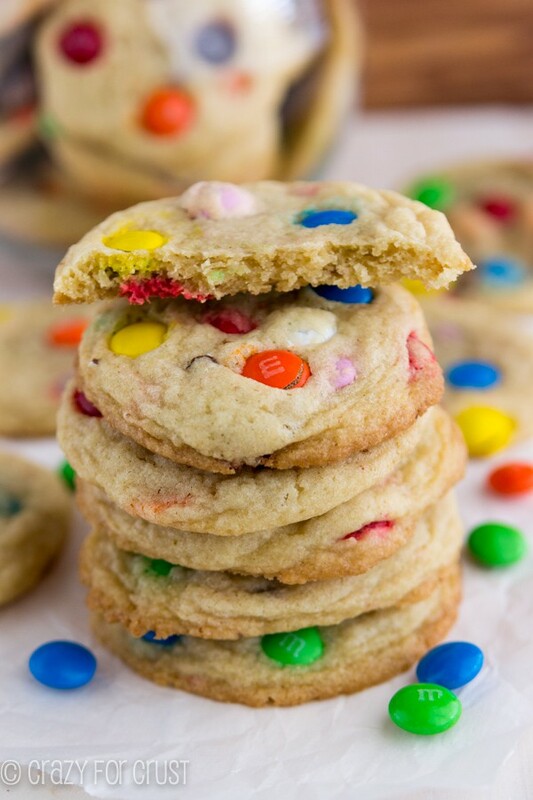 Combined, all three make the perfect sugar cookie…with M&Ms. The other thing I love about this cookie? That you can make them dairy-free really easily. We don’t eat dairy-free very much, but my daughter has a BFF who is allergic. Whenever she comes over, I like to have something she can eat, especially at parties. When we bring treats to school, I like to make them so she can enjoy them too. I mean, it’s hard enough to be a kid with allergies – and even harder when you can’t enjoy all the things your friends are eating. I asked around on Facebook and Christi and Averie both told me about Earth’s Balance Vegan Buttery Sticks. They’re actual sticks, not a spread, and they perform much like butter. And guess what? They do! I made two batches of these cookies: one with regular butter and one with the Earth’s Balance. They both turned out exactly the same…except I liked the Earth Balance ones almost better! Again, M&Ms are NOT dairy-free. However, you can use any vegan candy or chocolate chip. Chocolate ChocoNoNos are vegan and diary allergy approved. Now we have a few dozen M&M sugar cookies in the freezer so she can enjoy one whenever she’s over to play. And it’s ALL I can do not to eat them myself. Because M&M sugar cookies are my addiction. And I bet they’ll be yours too! 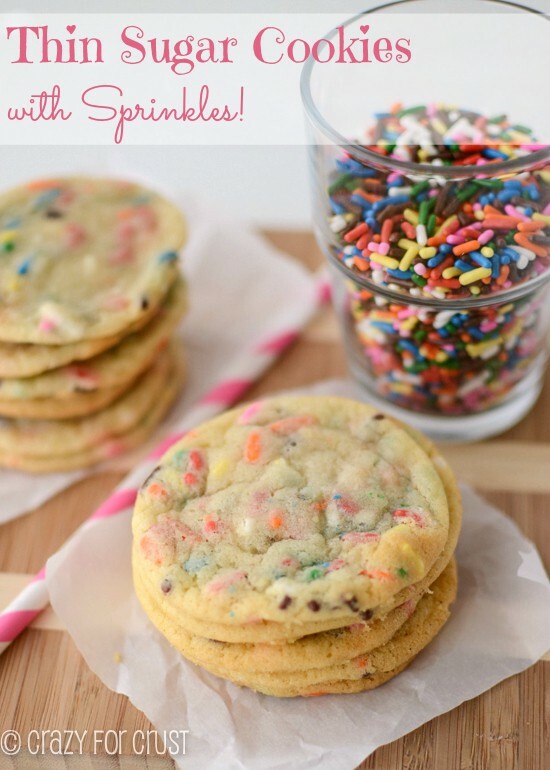 The perfect sugar cookie - with M&Ms and the option of being dairy free! Cream butter and sugar in the bowl of a stand mixer fitted with the paddle attachment. Beat in egg and vanilla extract. Mix in baking soda, cream of tartar, and salt. Slowly mix in flour. Stir in 2/3 cup M&Ms. Scoop 2 tablespoon balls of dough (use a cookie scoop if you have one) onto cookie sheets. 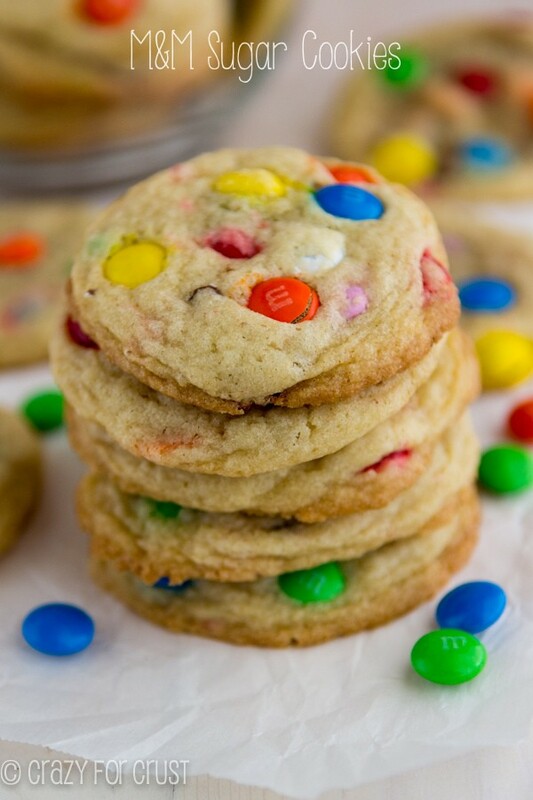 Top each cookie with 4-5 additional M&Ms. Bake for 10-12 minutes (10 for slightly underdone, 11-12 for more done). Cool 5 minutes before removing from cookie sheets. Place on a wire rack to cool completely. Ah, I just read the previous comments. You are being bombarded. But I think justifiably. I suggest you remove this recipe from your site or change the name to something else, and say, for those who are not milk intolerant, M&M’s is another option. You are, if unintentionally, misleading your readers, some of whom are desperately trying to find options for their kids. Like me. Thanks, and good luck with your site. M&Ms are not dairy free. I understand the recipe gives a dairy free option, however it does come up when you search for dairy free cookies, and it’s a bit misleading.